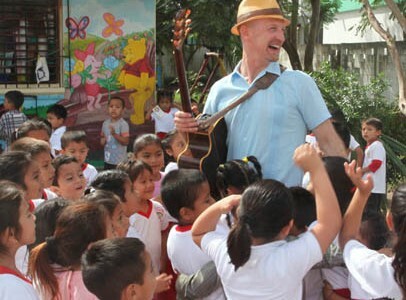 A Latin GRAMMY Award winner for Best Children’s Album, Mister G (Ben Gundersheimer) has been called “a bilingual rockstar” by The Washington Post and “irresistible” by People Magazine. His 2017 release, Mundo Verde/Green World, is a collection of environmental-themed songs which were debuted at his concert during the National Climate Rally in Washington, DC. Spanning genres from bluegrass to bossa nova, funk to folk, his dynamic, original music has won praise from The Boston Globe, Chicago SunTimes, People, New York Post, and Parents magazine.